THICKENER: Made of PREMIUM QUALITY SUS304 stainless steel which passed FDA certification. More thicker and more durable than others! MORE HEALTHY & NONSTICK:This fried egg mold using food grade stainless steel which is more healthier and nonstick than other material like Silicone material. 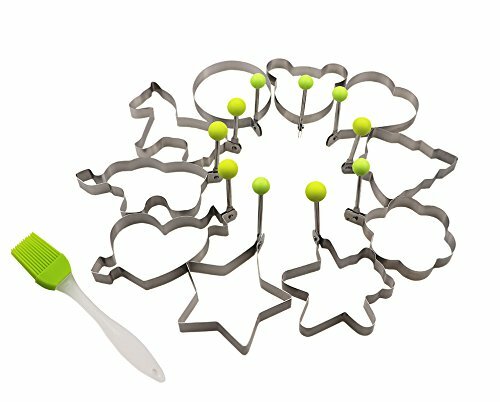 ENJOY A COLORFUL BREAKFAST: 5PCS Different Shapes Fried Egg Ring Set:Star; heart; Round; Plum Flower; Mickey.Avoid boring.Special design for cooking eggs or pancakes for your lover as well as your family. MULTI-PURPOSE : Maypal Pancake Cooker ideal for families who want to make breakfast quickly and easily with eggs, pancakes, cookies, breakfast sandwiches, fritters, and even omelettes . Get the perfect fried egg! Easy to pop out of mould straight onto the plate in just a few minutes. If you have any questions about this product by FDIO, contact us by completing and submitting the form below. If you are looking for a specif part number, please include it with your message.